Summer here runs at a summer pace. That means some unscheduled time to figure out what you want to do: the slip & slide, play on the playground, climb in the Adventure Center, play cards before the camp day begins, just sit and talk to camp counselors, teachers and friends at the picnic table, time to sit and read a book (yes, true! ), time to pick tomatoes in the vegetable garden and eat them! 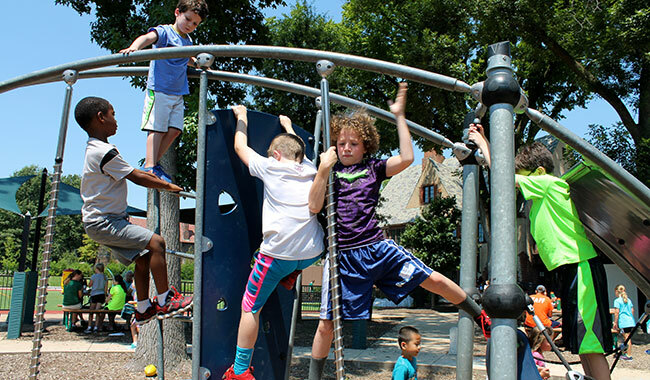 What's unique about Forsyth School is that the backyards of our six houses form the playgrounds. So, it's an old-fashioned summer experience–hanging out in the backyard with friends. 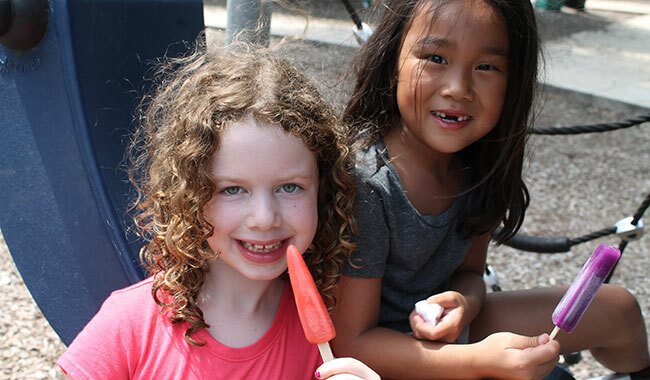 And much like the school year, multiple activities unfold: adults and kids eating lunch at the picnic tables (yes, we do that during the school year) while a group of kids or several groups play soccer, play on the playground or on the sport court. It feels like an urban park. All that's missing are dogs chasing frisbees. 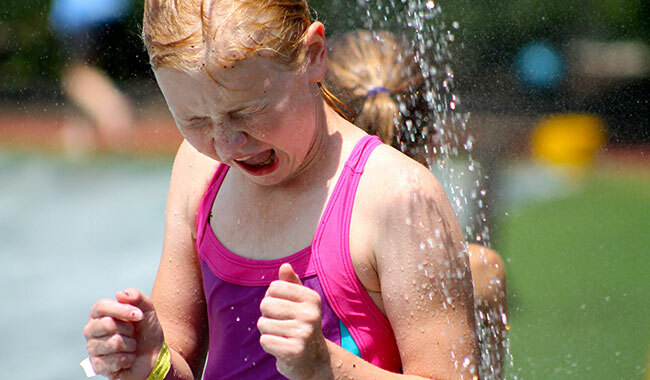 The slip & slide, sprinkers and hoses are part of the backyard experience. Kids absolutely LOVE this! 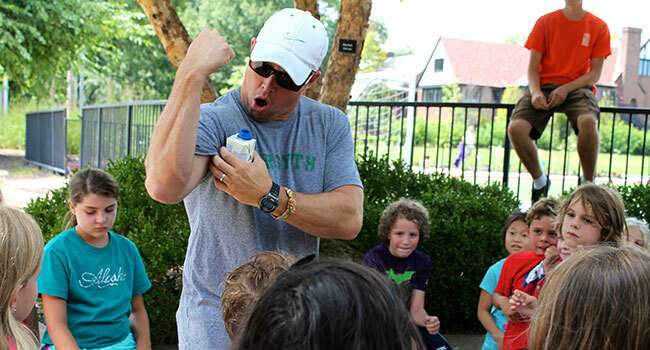 That's Coach Harris, protein shake in hand, telling the kids all about the benefits of protein in building strong bodies. The kids are hanging out waiting for popsicles. 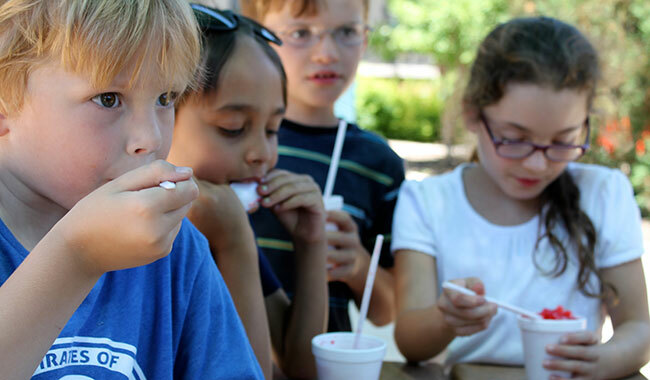 Popsicles are a M-W-F treat, but sometimes campers get snow cones (below). 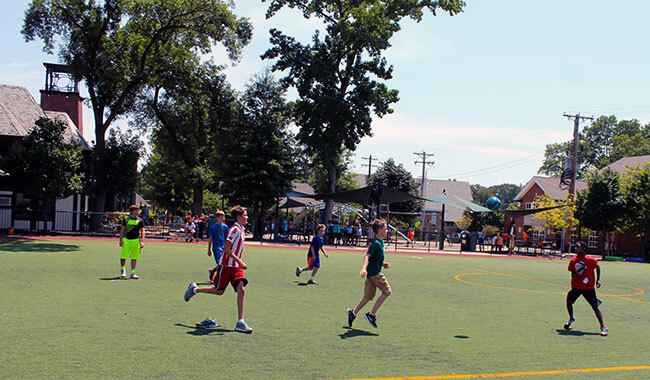 It's lunch time: soccer on Falcon Field, lunch under the sail awnings, kids on the playground equipment (below), and kids on the sport court. 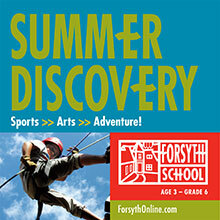 That's Forsyth, and it's what we love–children and adults alike.